A decision is looming in the bribery trial of U.S. Sen. Bob Menendez that could significantly alter the legal landscape for future corruption cases. After hearing six weeks of testimony and viewing dozens of emails and documents that prosecutors allege show Menendez schemed to help a wealthy friend in exchange for free plane rides and luxury hotel stays, jurors may never get to deliberate those points. That will depend on whether U.S. District Judge William Walls decides Monday to dismiss the bulk of the indictment against the New Jersey Democrat and his longtime friend, Florida ophthalmologist Salomon Melgen. At issue is a 2016 U.S. Supreme Court ruling that overturned the conviction of former Republican Virginia Gov. Bob McDonnell and narrowed the definition of bribery. In recent months, it has led judges to throw out bribery convictions for three former public officials, including a U.S. congressman. 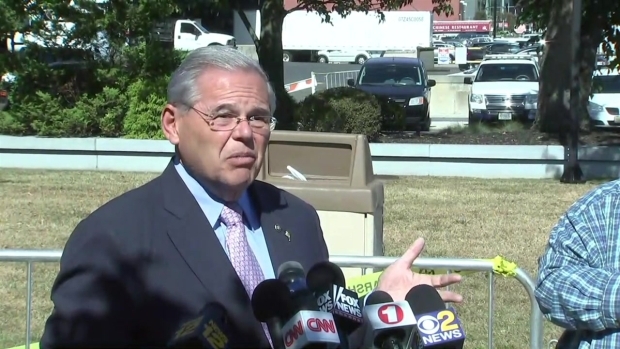 U.S. Sen. Robert Menenedez, a New Jersey Democrat, blasts President Trump's response to the hurricane devastation in Puerto Rico from outside the federal courthouse in Newark Wednesday, where he's undergoing trial on corruption charges. 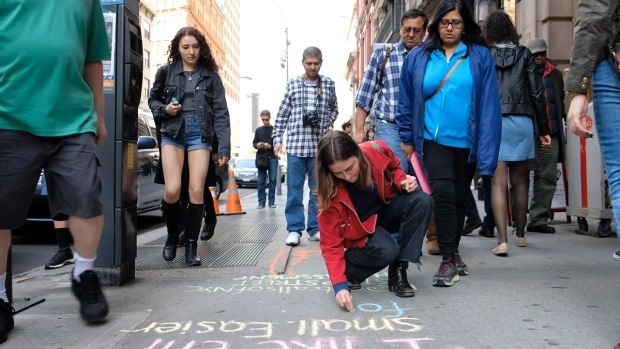 Walls "would be taking an unprecedented action if he decides that way," Alan Zegas, a veteran white-collar defense attorney, said of the possibility Walls could dismiss the charges. "But this is a gray area of the law, and the McDonnell opinion does leave a lot open to interpretation. This area has long been elusive." Walls acknowledged last week the effect McDonnell already has had on corruption prosecutions. "I know the prosecution had a heyday before McDonnell, and now they have a doomsday after McDonnell," he said half-jokingly. After the prosecution rested its case and with jurors out of the room, Walls surprised some when he appeared to put to rest what was expected to be the trial's central issue: whether Menendez's meeting and interactions with government officials could be considered "official acts" under McDonnell's new, narrower definition of bribery. Instead, he focused on the so-called "stream of benefits" theory, which in the past has held that a bribe doesn't have to be made with the intent to prompt a specific official action. The indictment charges Menendez accepted the flights on Melgen's private plane and other gifts over a seven-year period in exchange for pressuring executive branch officials on behalf of Melgen in an $8.9 million Medicare billing dispute and a contested contract for port screening equipment in the Dominican Republic. 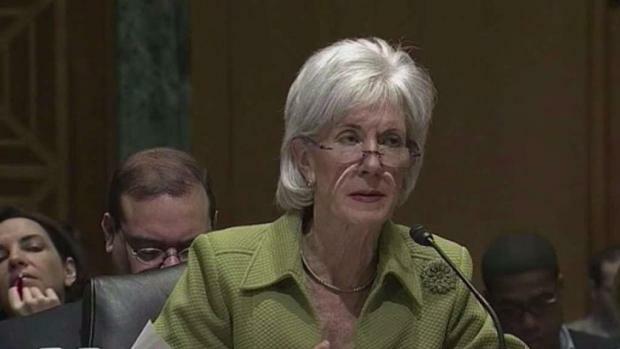 Former Health and Human Services Secretary Kathleen Sebilius testified in the trial for Sen. Robert Menendez on Tuesday. Defense attorneys for Menendez and Melgen contend language in the McDonnell decision requires that an alleged bribe be given in exchange for an official taking an action —or agreeing to — on a specifically identified "question, cause, suit, proceeding or controversy." Menendez attorney Abbe Lowell argued the prosecution used a "mix and match" strategy to pair up Melgen's gifts with actions Menendez took over the years, without establishing direct connections. "They are one, two years apart," he said. "Sometimes the bribe is allegedly for something three months before." In response, Justice Department attorney Peter Koski argued the Medicare dispute and the port contract were the "identified questions" and that a public official doesn't have to specify how he will perform his end of the bargain. In a brief filed Saturday, prosecutors cited cases since the McDonnell ruling in which, they wrote, federal appeals courts have left the stream of benefits theory undisturbed. Invalidating it, they wrote, would "jettison the vast majority of bribery prosecutions, and broadly legalize pay-to-play politics." Some of the confusion rests in the fact that the McDonnell decision didn't directly address the stream of benefits theory but focused more on the definition of official acts, according to Kelly Kramer a Washington, D.C.-based attorney with experience defending public corruption cases. Pre-McDonnell, juries could infer a bribery agreement based on an overall relationship, Kramer said. "Here, if you have a narrow focus, that relationship can make it look official and tawdry and terrible, but unless you can prove there was an exchange of a thing of value for a specific act, it's a much more demanding standard."